Last Monday at noon marked the start of the fourth annual Amazon Prime Day. For one and a half day, Prime members can get products from the Amazon catalogue at largely discounted prices. More than a million deals worldwide were expected. Amazon – A never-ending success story? Year after year, Amazon breaks all of its past sales records in its history with Prime Day, even compared to Cyber Monday and Black Friday. Last year, Prime Day sales increased by more than 60 per cent over the previous year. According to Internet Retailer, this rapid upward trend in 2018 will reach the next peak. 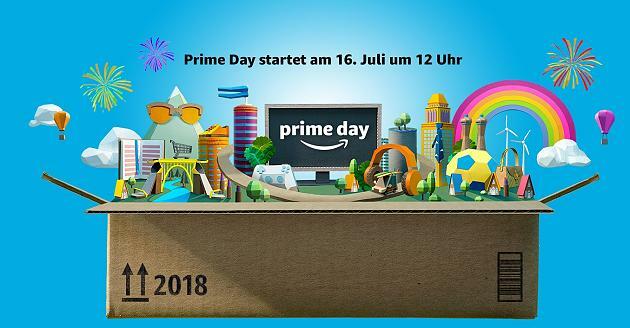 Therefore, Amazon has probably expanded Prime Day from 30 to 36 hours and from 13 to 17 countries. In addition, Amazon has more Prime members than ever: 100 million worldwide. Amazon isn’t just trying to cast a spell over online shoppers, but also to continue spreading its Alexa-enabled products. How did retailers and manufacturers succeed in the marketplace? Find and take advantage of more than just bargains? Amazon’s strategy is well known – customer focus and services are the top priorities: Free returns, fast shipping, and in addition there is the possibility to stream thousands of series, videos, and music included. The tech giant built on its enormous logistics power in this year’s campaign to ensure delivery of the massive amount of orders as fast as possible. For all avid buyers, the rules of the game were the same. In order to be able to have gone shopping on Prime Day without any problems, you’d need to secure a prime membership in advance. After that, it was recommended to download the respective shopping app as it offered many benefits (and discounts). For example, all bargains were displayed under “All Deals”. In addition, you could tap the “Watch” button to get push notifications on your smartphone as soon as the offer started. But the whole thing worked on the desktop as well. There were, however, also a few innovations: Amazon offered, “Prime Day Launches”. There, Prime members could buy exclusive novelties, content, and special edition products from established as well as new, up-and-coming brands. As part of this offering, engineering products were released for the first time on Prime Day, July 16, like the brand new Microsoft Surface Pro. In addition, huge Smile boxes found their way across land and sea to New York, Los Angeles, London, Tokyo, and Milan in advance. In the course of a large-scale campaign, these mysterious boxes were constantly spurred on. So Prime Day was far more than just a shopping fest. Like 2017, Alexa-enabled devices were the top products. Echo devices, Fire TV, and tablets received hardly surprising discounts. In addition, you could’ve saved a lot of money on all Amazon’s own products and services, such as Kindles, Food, Fashion, Amazon Music, and Twitch Prime. These special offers, which are exclusively for voice-controlled products, show once again that the online giant wants to rely on Voice-First. The emergence of smart devices is growing parallel to Amazon’s membership. In fact, Amazon’s quickly added new types of products to the Echo range, such as the Fire TV Cube, Echo Look, or the AWS Deeplens camera. This is in line with the streaming behaviour of Amazon users, who are increasingly consuming more media content and buying more consumer goods. In the same breath, there is a growing supply of Echo devices that do online shopping or stream playlists via voice command. The underlying idea: The more networked devices, the better, and the more lucrative the ecosystem, Amazon can continually seek to captivate even more customers. Of course, there’s the question of how to benefit as a retailer and manufacturer from this massive traffic. All retailers who sell their products on Amazon should take into account that Prime Day itself already leads to more traffic. Even if, as a retailer, you don’t have any special Prime Day deals, you have the opportunity to attract more potential customers. Here are a few tips that retailers and manufacturers should consider. Does the information match the search query? Are product images and videos high quality and relevant? Are the price and shipping options attractive and diverse? How do old products perform? Although it appears different, discontinued products still play a role: Search engines use long-lived factors such as backlinks and the history of click rates to create search rankings. Amazon Marketing Services (AMS) are always a great way to catapult products to the top of an Amazon search page. The fact is, Amazon has been encouraging sellers to use this service since 3 July. In addition to relevant terms with extremely high search volumes, successful brands invest in related terms outside of their industry to generate additional revenue at lower CPCs. Is enough attention given to customer reviews and their creation? According to MarketingLand, when it comes to verticals and price points, consumers are more interested in the sheer number of reviews on a page than in the overall rating.